Social Media has attracted almost everyone across the spectrum in today’s world. Whether its users or brands, Twitter, Facebook, Instagram, Youtube and the likes are popular almost everywhere. While many use it to brand themselves and create their online identities, there are others who use it to keep in touch with friends. Sharing thoughts, photographs, links, videos – there’s so much and more one can use social networks for. But don’t you find it difficult to manage all your networks? Wouldn’t it be useful to analyze the social activity across all the networks on one platform altogether? Here’s where ThoughtBuzz comes in. This was an organization setup in 2008 to provide insights on social platforms for a user through big data and cross platform analytics across different social networks. It has offices in India, Malaysia, Indonesia and Philippines. 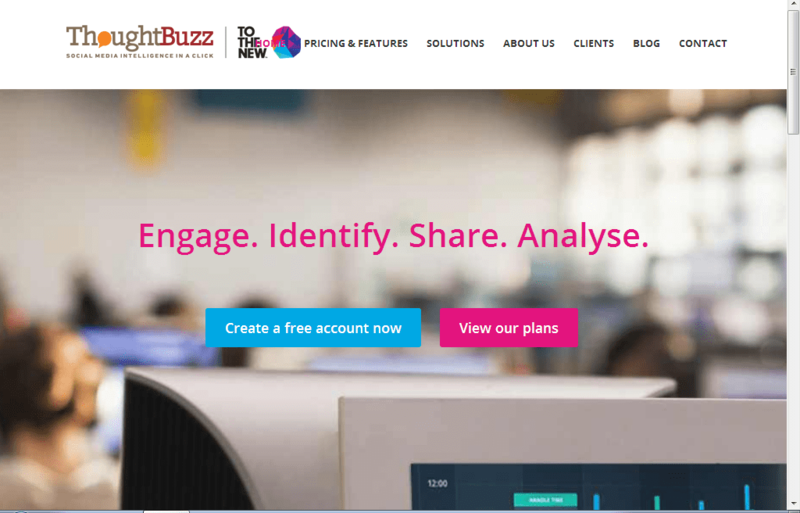 Thoughtbuzz provides a variety of social insights from evaluating a brand or a user’s social media presence to helping generate additional leads and clients to even establishing and reinvigorating the social media strategy of the organization. 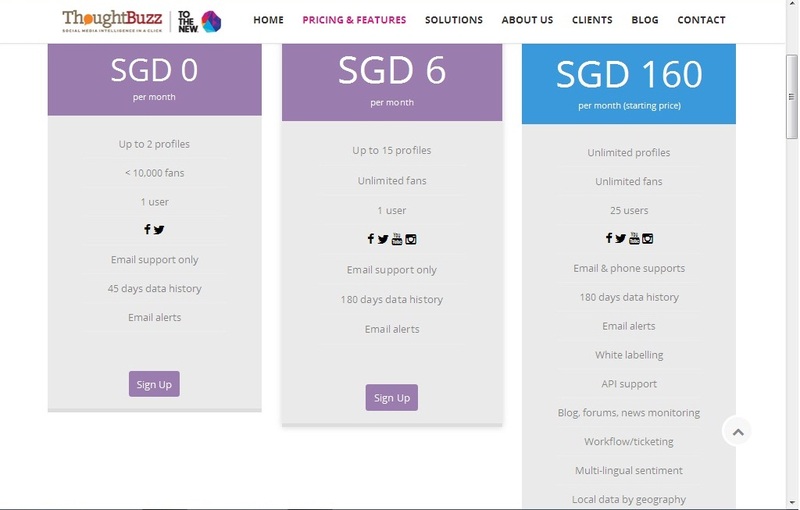 There are three kinds of plans (Free, 6 SGD per month and 160 SGD per month). They differ in the social networks evaluated as well as the other insights provided. There is a simple way to signup for the FREE version which I tried. 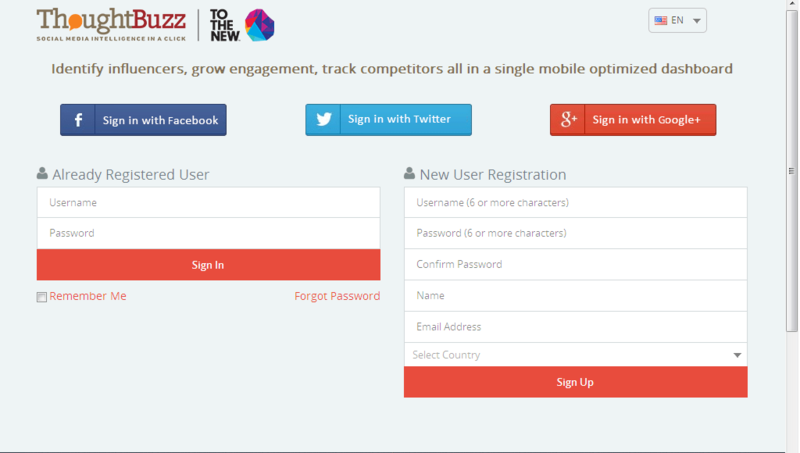 A user can either register by entering the user details or login using Facebook, Twitter or Google+ login. On entry, the user has to select the Country and click on Submit. 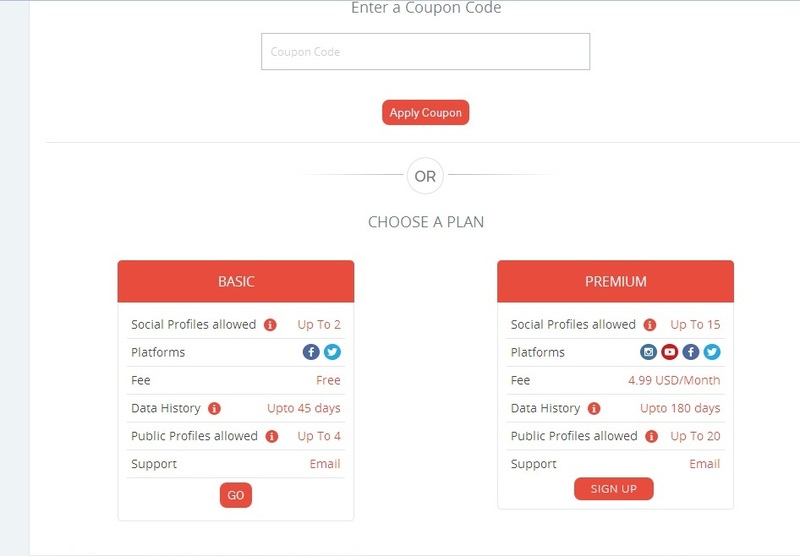 The basic version allows to add only 2 social profiles (Facebook and Twitter) while the premium version allows adding 5 social profiles which includes Instagram, YouTube and Linkedin as well. 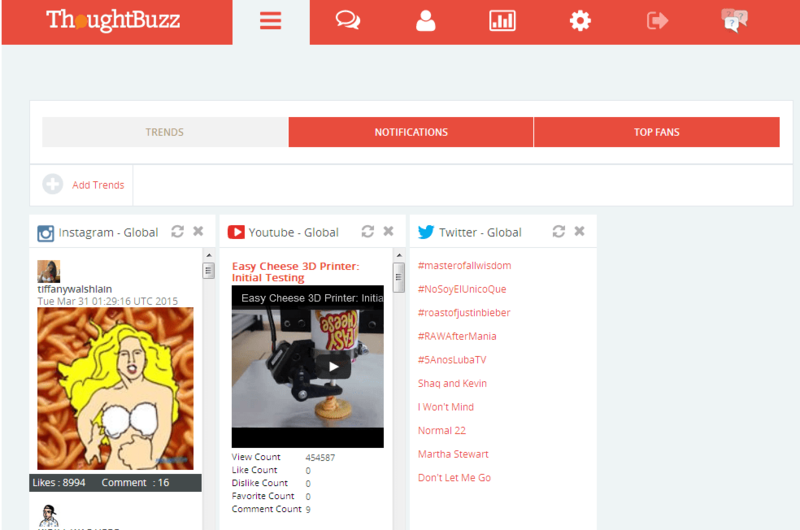 A dashboard with the global Twitter, YouTube and Instagram trends are visible. This can be customized according to one’s country. The user can add his Facebook and Twitter accounts to get going. I logged onto Facebook and imported my fans from my page ‘Aseem Rastogi’. There is a feature for the user to engage with friends, family and other users or brands across all social networks within one dashboard. The posts and tweets can be scheduled and posted at a later date and time or posted immediately depending on the user’s choice. The graphs and charts feature helped me analyze my reach, likes, followers etc. on both Twitter and Facebook for the past 45 days. For brands, this is an excellent feature to compare the social activity on the different social networks. In case if there are any questions, there is also the FAQs and ‘Contact Us’ feature which is quite useful if one is still trying to get through the different features of the site without much success. UI: Thoughtbuzz has a pretty neat and clean User Experience for users and brands to navigate through the website. Graphs and charts: These insights which detail out the followers, likes and overall engagement of the users and brands on social networks is quite helpful to get insights on the social activity and make appropriate business decisions. Competition: Klout provides social insights on all the social networks provided by Thoughtbuzz and many more in the free version. Thoughtbuzz is an interesting and easy to use social monitoring tool for various brands and users who would like to keep an eye on their social influence and activity. Linking to NaBloPoMo (National Blog Post Month – March – My post no 12 for this month. 100 word fiction: His love for music..
Yeah Shweta quite a good tool to be honest :). In the social media age we are in, I am sure such tools are all the more important than we think ;).